The Irish Terrier is the oldest of the four Terrier breeds from Ireland. 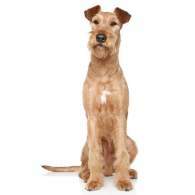 The ban on ear-cropping that is recognized today in the UK was first pushed by the Irish Terrier Club in the 1880s. The Club first persuaded The Kennel Club to bar any Irish Terriers with cropped ears from competing. Over time, the ear-cropping ban became required for all dog breeds. These former farm dogs and ratters were quickly found to be great gundogs, and all of that was dialed up when they literally went to war in the early 20th century. They were also bred to be companions. On the farms, they would work all over the place but come home at night to be with the family. They are best with experienced dog owners who possess patience. There may be many Irish Terrier problems for those first-time dog owners who elect to adopt one of these dogs. Irish Terrier dogs 101 will tell you that these dogs are a handful. They are the longest-bodied breed of Terrier, and they have a personality that can be vexing. Properly trained and socialized, however, they can be taught to channel their endless energy and high-alert attitude to be useful. Ranked number 53 in the international Intelligence of Dogs list, these pooches can sometimes be a bit too smart for their own good. They won't hesitate to try and learn all they can about things, even at their own peril. They are fiercely independent and this can be good or bad. Be sure to learn as much Irish Terrier info as possible to make it good. Once these dogs understand who is the alpha and that they can trust you, they will possess and exhibit an undying loyalty and devotion to and for you. They are fine by themselves, but if you are around they'll want to be with you. They are very aware of their environment. As they are Terriers, you can bet they are perpetually active. They need an extraordinary amount of exercise. They are sometimes called the Irish Water Terrier, an informal name that was perhaps coined a long time ago by a seminal IT breeder, William Graham. He remarked that there were no Irish Terriers aboard Noah's Ark because they could just as easily swim beside it. Irish Terrier history may have its origin in the mid- to late-17th century, but as the first known records date to the 1870s, that tends to be the accepted period. In "The Dog," a widely respected 1872 book by Idstone (published by Cassell London), there was nothing about Irish Terriers. Early versions of the emergent breed were surely around before these dogs started appearing in dog shows, such as the 1873 exhibition in Dublin, but apparently not too long before this show. Nevertheless, the Dublin dog show prompted a surge in national popularity for these dogs. By 1879, the Irish Terrier Club was founded in London by members from Belfast who had traveled to Dublin for the aforementioned show. A standard was drawn up, and throughout the 1870s, Irish Terriers became common at a great many shows throughout Great Britain. This newly established breed was seen in conformation in County Cork, Belfast, Glasgow, Bristol, Manchester, Wolverhampton, Trent, and the Kennel Club Show at Alexandra Palace. As the end of the 19th century drew to a close, many more Irish Terrier clubs were founded. Several champions emerged as did a handful of books and magazine articles. In the early 20th century, the Irish Terrier earned a new distinction in the rat-filled trenches of World War I. Along with being excellent vermin exterminators, the dogs were used as guards and messengers. They earned the nickname "dare-devils" for their red coats and bravery. Sadly, this heroic reputation did not endure. The universal cruelty of the war had people demanding a new world. Most things associated with the war tended to be ignored or rejected. Many attempts to revive the breed's popularity failed. When World War II erupted, the dogs nearly died off. Some breeding stock survived, and the breed became popular in the USA during the 1920s, but there were few Irish Terriers remaining. The Irish Terrier coat and appearance is all about counterpoint and angles. These dogs may seem gangly and unbalanced as puppies, what with their spindly legs, still-developing bodies, and constant rambunctiousness. Once they are mature, however, they have the appearance of a chef's cleaver ready to race forward with a significant tail-weight to propel them. The angles are everywhere. The lithe, rough-haired and reddish daredevil dogs have a serious appearance that is obvious on the flat face, boxy brow, and rectangular muzzle. The triangular, forward-folded ears sit above and outside the very serious eyes that, if the head is cocked to one side, give them a nearly quizzical look. The deep chest, long torso and even longer legs lend to this look. The tail, which is medium-length and held pointing up, implies the dog might float on a wire as he runs. The small, graceful paws at the end of the long, straight legs add to this light, fleeting form. The strong hindquarters complete the impression of a coiled spring ready to bounce forward. The coat is the counterpoint to all else, its seemingly broken hair being in contrast to the rest of the almost-mathematically designed body. The Irish Terrier was previously called the Irish Red Terrier. In the 1870s and early 1880s, there were other colors for this breed. There are no longer those black Irish Terriers, or black and tan Irish Terriers or any other colors. These other coat colors were deliberately bred out long ago. There have never been white or blue Irish Terriers either. Some people may confuse the Kerry Blue Terrier by calling this dog the Kerry Blue Irish Terrier, but that is not the correct breed name. Today, however, this is not only a red-only dog but the only Terrier that is all-red. There are distinguished shades of that red, however: red, red wheaten, and wheaten. You may have heard a good bit about Irish terriers being big dogs — and they are, as far as Terriers go. But in the complete world of dog breeds, the Irish Terrier size comparison makes them medium-sized at best. Fully grown males and females alike stand about 18 inches tall. The male Irish Terrier weight is slightly heavier than the female, however. Males weigh approximately 27 pounds whereas females tip the scales at about 25 pounds. There are no overtly distinct variations of this dog, let alone multiple Irish Terrier breeds. There is just one breed of Irish Terrier, and that dog is red. In the late 19th century, there were a few colors for the Irish Terrier. (These other colors are discussed in the Coloring section.) By the 1880s, the red coat was made exclusive. There are the occasional attempts to sell what is termed the miniature Irish Terrier, the Toy Irish Terrier, and even the Irish wire haired Terrier. There are no mini or toy Irish Terriers. 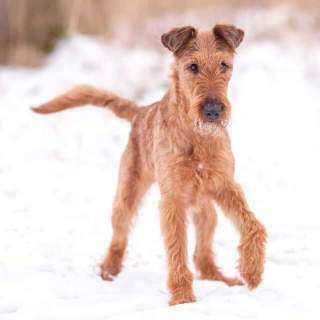 On the other hand, there is a very detailed level of subtle variations of the Irish Terrier coat. These varieties tend to be unseen by the lay eye and only ably pointed out by experienced dog show judges. There are said to be seven types of Irish Terrier coats: broken, curly, flat, open, smooth, soft (or silky), and wavy. The broken coat is the most desirable one and is the wire haired Irish Terrier that is seen at most dog shows. It is dense, fully doubled and the only proper one. The curly coat tends to be found on dark red dogs, is without a proper undercoat and is sparse. The flat coat tends to have little undercoat and is close-fitting. The open coat has little undercoat and is typically lighter than most regular reds. The smooth coat is similar to that of the Smooth Fox Terrier. The soft coat is silky and has no undercoat. The wavy coat is difficult for most anyone to identify, as it has a sound undercoat and is similar to the broken coat. 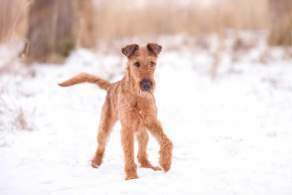 If as few as two generations of wavy-coated Irish Terriers are bred, however, they will produce several subsequent generations of curly-coated dogs. The Irish Terrier temperament is well-established if long-forgotten by many people. These unhesitantly fearless dogs have retained their derring-do from the days when they were nicknamed "daredevils." Nonetheless, they are very playful and too ready to romp around the yard with you and the kids. Their personality may be a bit much for some people as they are difficult to train, hard to restrain and given to chasing and exploring anything and everything. Their bold behavior is best for people with patience, humor and, well, more patience. One of the breed's lesser-known traits is a mischievousness that can be trying. For some people, Irish Terriers may be a bundle of typically frustrating Terrier characteristics. Others will know these to be great family dogs, especially for one-dog homes. They are extremely devoted, driven to protect and yet always ready to be doted on by their loved ones. Below are pictures and images of the Irish Terrier. Irish Terriers are by no means lapdogs, let alone easy pets with which to live. They bark a lot because they are great watchdogs. They are stubbornly independent, which is why they aren't prone to separation anxiety. They are aloof to your newly introduced friends because they want to make sure they'll do you no harm. These dogs are best suited for farm life or at least houses in wide-open, rural areas. They can do well enough in suburban settings so long as they are securely fenced. If you must live in an apartment, however, you will need to have a highly active lifestyle that includes walking and exercising your Irish Terrier daily. For readers wondering if there is an Irish Terrier hypoallergenic characteristic, you're in luck: there is. These dogs don't shed much. Allowed outdoors frequently, they should keep their coats stripped of dead hair by the branches and brambles they run through. The Irish Terrier is one of those dogs with fewer health problems than most dog breeds. They do have some typical concerns, but none that appear to be somewhat breed-specific save for bladder issues. The Irish Terrier's average lifespan is rather wide at 12 to 16 years.